If you or your kids love the ocean and it's extraordinary marine life, then you must visit the latest exhibit at the Vancouver Aquarium this summer. The Discover Rays Touch Pool was an experience was worth waiting for. For a month Jacob and I were eagerly waiting to go to the aquarium to visit the Discover Rays Touch Pool by marking our calendars and counting down the days. Finally the day came, full of excitement we went to the aquarium just in time for the first showing. As my sister and my 8 month-old nephew, Javed, parked the stroller, Jacob and I anxiously waited in line to enter the exhibit. Before entering there was an Aquarium staff member greeting us and informing us on how to interact with the rays. (FYI, strollers are not permitted in the viewing area and children are required to walk or be carried). Inside there was a cleaning station to wash your hands. After washing our hands and rolling up our sleeves, we went to find a spot. The spot we found was worth the wait. Jacob lay, tummy down, flat on a platform while I stood next to him. We held our hands in the water, waiting for the rays as they glided by. "I want to touch a big one!" Jacob said with excitement. "How do they feel?" I asked. 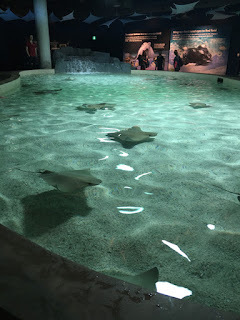 The exhibit has a 50,000L pool, which features two species of rays: Cownose and Southern stingrays. The Cownose stingrays seemed to be more curious as they sometime came into investigate or linger around certain area. One came right up to Jacob hand and bumped him with it's cownose. Talk about close encounter! The Vancouver Aquarium did promise an up-close and personal experience and it certainly was. The exhibit wall's are full of pictures and vast information on both Cownose and Southern stingrays, along with others species. It also highlights that these "Angels of the Ocean" are skyrocketing towards extinction due to over fishing and human activities. Before leaving we asked Jacob what was your favourite part of the Discover Rays Touch Pool. He replied, "touching the rays and seeing the teeth because they were flat and used for munching."